School is primarily a place to discover, learn and strive for success but it should also be a place to make friends for life and to enjoy growing up. Working hard, being appreciated and having fun are integral parts of a Northwood College for Girls education. We believe that attending extra-curricular clubs is extremely valuable for the girls; not only does getting involved help the child harness and develop talents and new skills, but it will also help her grow her friendship base. Bearing this in mind we work extremely hard to be able to offer over 70 clubs each week across our school with pursuits as diverse as cookery, computing, chess, languages, manga art and trampoline. Ensuring that a Northwood College for Girls education delivers unprecedented value for money, each day provides unique opportunities and experiences for your daughter to benefit from and discover their varied and unique talents. Many of our girls enjoy the challenges of service in the community or the Duke of Edinburgh Award Scheme where they acquire skills and invaluable experience that will serve them for life. Awareness of the needs of others and of the outside world is also crucial. Our Community Service programme and support for local and national charities contributes to broadening girls’ awareness of the needs of those less fortunate than themselves with initiatives such as hosting an afternoon tea for the older residents of Northwood and visiting a local residential care centre where they girls sing with the visually impared residents. Senior school girls regularly help out in our Early Years Centre and in Junior School. School trips abound ranging from museum, theatre and gallery visits in the UK to language exchanges, skiing in the USA, water-sports in the South of France and the World Challenge adventure expeditions that see the girls travel to far flung destinations, such as, Borneo and Peru! From war hero, Simon Weston, to industry leaders and from celebrity authors to the mobile zoo – a stream of visitors to school bring with them tales of success that inspire and motivate our girls and fire their imaginations. The ‘Mayou Lecture Series’ was set up as additional enrichment in order to welcome inspirational speakers to the College to deliver lunchtime lectures for the girls. Last term, we had a deeply inspiring talk from Sally Kettle, who rowed 5,000 miles across the Atlantic Ocean! There are a number of extra-curricular activities that supplement the girls’ timetables, including the after school Gifted and Talented club T+, for Years 6 through to Year 9. This club is run by both staff and the most able students in Year 10. 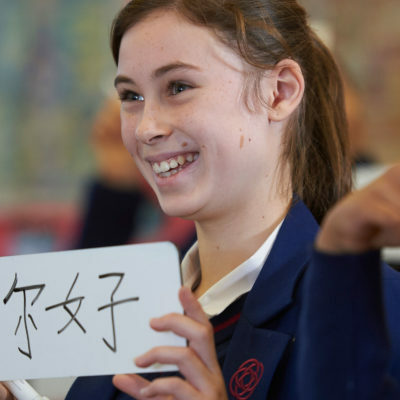 Sessions have included learning Mandarin, the works of Jane Austin, how to carry out a successful advertising campaign, Chess master-classes, language games and many more fun, stimulating and thought provoking areas.